Magnetic Resonance Imaging (MRI) services have resumed at the BVI Health Services Authority. Chief of Medical Staff and Medical Director, Dr. June Samuel said services from the imaging unit were all affected post hurricanes Irma and Maria resulting in significant down time for several of the available modalities of the unit. “We have been working tirelessly to bring these services back on line as these represent a crucial arm of diagnostics for clinicians in their day to day care of patients,” she said. According to Dr. Samuel, 95% of patients presenting to the hospital will require some level of imaging, and having this unit 100% functional was one of the key priorities of the organisation. The Chief of Medical Staff also noted that from a financial and patient care point of view, the resumption of the services is essential for the people of the Territory. “We provide an affordable option for MRI services and we also have an American Board Certified MRI Technologist working with us, Mr. Lemuel Clyne. Our customers can be reassured that we continue to be committed to the delivery of excellent compassionate, client centered healthcare,” she further added. MRI services must be pre-authorised by the National Health Insurance, but other types of insurance are also accepted. For appointments persons are invited to contact the Radiology Unit at 852-7727 or via email at x-ray@bvihsa.vg. 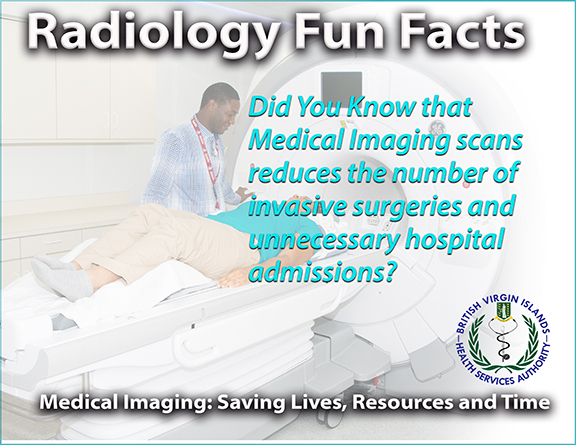 MRI is a superconducting magnet that is used to manipulate the body’s protons without the use of radiation. This enables better evaluation and characterisation of tissues which aids clinicians in diagnosing and treating patients. BVI Health Services Authority is committed to becoming the leader and preferred provider of Health Care in the Virgin Islands and Regionally.